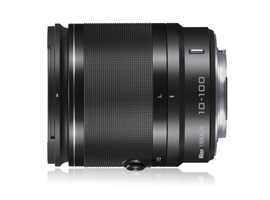 While the original PD version of this 10x optical zoom, the equivalent to a 27-270 mm targeted video makers, the additional weight and bulk associated with the powered zoom mechanism was at odds with those looking to use it for travel photography. Albeit now adopting a simple traditional mechanical zoom ring, the replacement is slimmer, lighter and at $549, around $200 cheaper than the original when launched. Internally, the optical construction has changed as well. It adopts 19 elements in 12 groups but has two ED glass lenses instead of three in the former version and three aspherical lens elements, up from two. The new model retains the stabilization feature of the original, focuses to 0.35 m (at 10 mm), measures 60.5×70.5 mm and weighs in at 298 g (10.5 oz.). 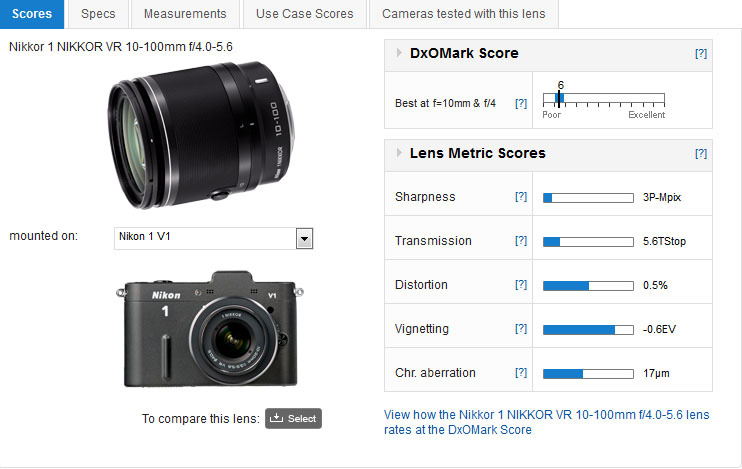 When measured on the 10-Mpix Nikon 1 V1 the new model achieves a somewhat low DxOMark score of 6 points. 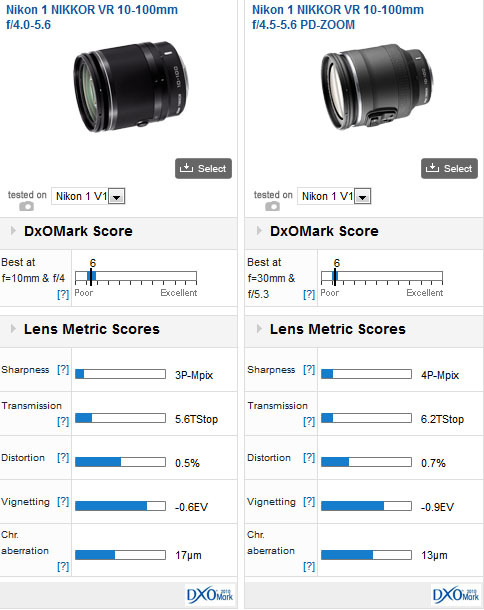 Much of the low score can be attributed to the disappointing sharpness score, which measured just 3P-Mpix overall. This model’s brightness was also lower than expected. Although the maximum-aperture is a modest f4.0-5.6, when measured the actual transmission values were quite a bit lower at every focal length bar 18mm. Thankfully, it performs best wide-open and has reasonably well-controlled illumination (vignetting). On the downside, it has high levels of chromatic aberration and barrel distortion, particularly at 10 mm. Compared with its forerunner the new model has lower sharpness overall but there are some worthwhile improvements. First, it actually has better transmission than the original. Nikon has also lowered both the distortion and vignetting, but even if the original wasn’t that well corrected for chromatic aberration, the new model is less so. Nikon has done well to reduce the overall size and weight (down from a hefty 516 g (18.02 oz)) to more practical levels but the result is a lens that has lower levels of sharpness and more unsightly chromatic aberration. Few could dispute how versatile a lens like this is, but critics will argue Nikon should have traded some of the ambitious zoom range for higher levels of sharpness.